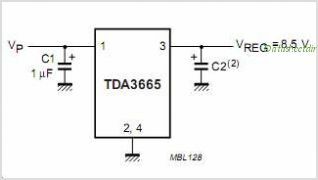 The TDA3665 is a fixed 8.5 V voltage Regulator with a very low dropout voltage and quiescent current, which operates over a wide supply voltage range. The IC is available as TDA3665 VP max. 45 V, -40 Cel max. Tamb max. +125 Cel and SO4 package (automotive)TDA3665AT: VP max. 45 V, -40 Cel max. Tamb max. +125 Cel and SO8 package (automotive). This is one package pinout of TDA3665,If you need more pinouts please download TDA3665's pdf datasheet. This is one application circuit of TDA3665,If you need more circuits,please download TDA3665's pdf datasheet.